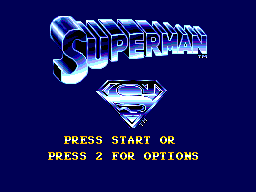 This is a platform game, with the added bonus that Superman can actually fly as an extension of the jump function. Heat vision and Super-punch powers are limited use power-ups that can be collected and maintained by collecting Blue S logo icons. The game is easier than it's megadrive equivalent, in my opinion, and is a lot more fun. Being able to collect and use extra super powers is a definite plus over the megadrive version, where you could only use one at a time. The game is often challenging, as some of the kryptonite powered enemies can move around the screen a lot quicker than you can! Limited lives and continues make for a steep learning curve. Despite being a megadrive port, several levels and set pieces are missing. However, there is enough here in five challenging levels to get you by. 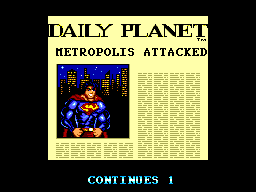 Superman does not disappoint in the graphics department, and at times you will find it hard to believe it is an 8 bit game. Both the main sprite and enemies have several frames to them, and move smoothly with very limited flicker. The highlight of the game is flying down a subway tunnel after a speeding train: obstacles that get in your way slow you down. The subsequent level boss show down on the train is very detailed for an 8 bit game; the train bounces up and down subtlety on the track. Each level looks visibly different. Firing several (wasteful) rounds of heat vision is the only way in which yoiu can provoke graphical slow down. Each level shares the same theme. It is a pretty catchy theme, that shouldn't cause you much irritation. The main title music and the endingf music are satisfying enough, and these three musical pieces are well tied together. 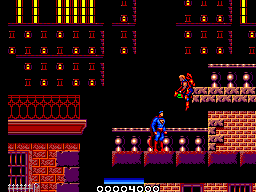 The sound effects, notably the heat vision laser, tends to override level music. Controls are pretty decent, and responsive. Heat vision, when available is achieved by pressing the attack button when airborne. The suoerpunch can be reserved for when it is required, because short presses of the attack button fire off weak punches. By pressing and holding attack while standing or crouched, releases a super punch. Superman can fly at two speeds, which is achieved by pressing up when jumping; when moving forward he will first of all hover forward and press both arms forward in the traditional Superman way! The graphical set pieces and indeed the ending are certainly worth seeing again. When mastered, the game represents a good half hour bash on the console, give or take a life or two. If you are easily irritated or expect an easy game, it may not be for you. It is certainly easier and more fun with an action replay code or two. As a superhero game, this will surely be on the wishlists of many. It is certainly a game you will need to get the hang of with a few replays, and also one to play carefully to get to the end; sloppiness is often punished with a big drop in energy!